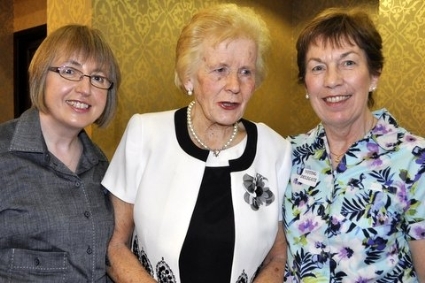 Social media and twitter are key to the future of the Irish Countrywomen’s Association (ICA), its recent AGM in Portlaoise heard. Speaking to the 300-plus crowd, President Liz Wall said social media was helping spread the work of the ICA, in particular Twitter and Facebook. The meeting also heard the ICA is set to publish new home and family book later this year, that it raised more than €30,000 for the National Breast Cancer Research Institute in Galway, its successful Tools for Solidarity in Tanzania collected more than 40 sewing machines and the association also provided 400 stoves to the charity cooking stove project with Vita. Among the speakers at the AGM were representatives from the Samaritans, See Change and Cappagh Hospital, ICA member Anna May McHugh of the National Ploughing Association, Paddy Leeman of the WI in Northern Ireland and Betty Gorman of the Laois Federation. The meeting heard five new guilds had joined the association during the year and four were in the pipeline. In addition reports on a recent Dublin Castle Vulnerable Families Conference, a joint Oireachtas submission on trafficking of women and girls for the purpose of prostitution were also discussed. Jill Kerby a financial guru gave a presentation on her Mother and Daughter Personal Finance Tour that is set to tour the country. The meeting also heard the ICA is the only Irish member of the campaign to designate 2014 as the European Year of Reconciling Work and Family life and work on this is ongoing. Other campaigns the ICA is involved in the coming year include Positive Ageing Week in September, Street Feast in June, two upcoming competitions sponsored by Pride Bakeries, the Care to Drive by the Irish Cancer Society, the work of Cappagh Hospital and the Associated Countrywomen of the World Triennial in India this October. The ICA President also encouraged every guild to ‘Sponsor a Bedroom’ during its 60th anniversary year of An Grianán. ICA Bootcamp mentors were celebrated for their role in winning an IFTA in 2011 and competiton prizes were also given out. Finally the Guild of the Year book was won by Two Mile House Guild in the Kildare Federation.